Here it is at last, the third part of YE GODS! 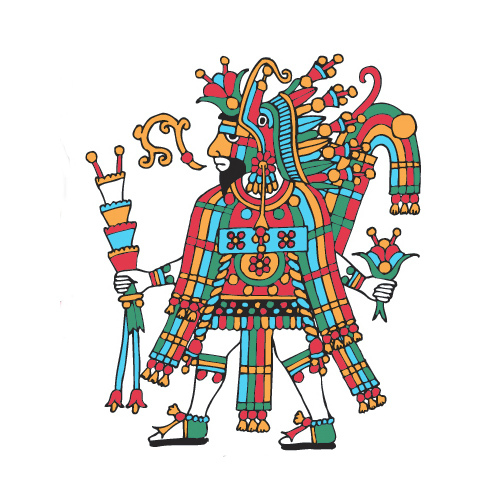 This is the promised illustrated commentary on the Aztec Picture-Books, a unique discussion with examples of the fifteen codices that survived the book-burning during the Spanish Conquest of Mexico. I can guarantee you’ll never have seen anything like this in terms of art history, mythology, and Aztec ethnography. It’s been a couple months since I last posted anything, (not that anybody out there really cares, I suspect), but the time has been well spent on completing this project, in and around many other developments in my life. Not the least of those was running around trying to set up an exhibition of the Aztec Icons, without success to date, and to interest a local non-profit publisher called Radius Books in making a book on the whole three-part YE GODS! shebang, which may still materialize. The next epiphany of 13 icons still remains to be drawn. In other developments, it took these couple months to move to a new apartment, including some weeks to move my iris garden to the new place. It’s splendid with a huge balcony/porch and a big area for a garden and enormously convenient to my gym and other amenities. In terms of iris, I’m thrilled to report that after five years of looking and wheedling, I’ve finally found someone to start up my plant recycling business again. A young fellow named Aaron jumped in with his shovel and has already been selling iris on Craigslist like hotcakes. He plans on selling at farmers markets around here and should do a land-office business, so to speak. Now my big plan is to go with the family for a vacation during the first week of July at Hot Springs, Arkansas. It should be a sentimental time because it’s quite close to my childhood home in the southwestern woods of that state. Maybe I can even get my grandsons to read BAT IN A WHIRLWIND!